Let’s face it, sometimes blogging is a chore. On the few days this summer when it hasn’t been raining in NC, sometimes I’d rather be gardening or building a fort with my kids. 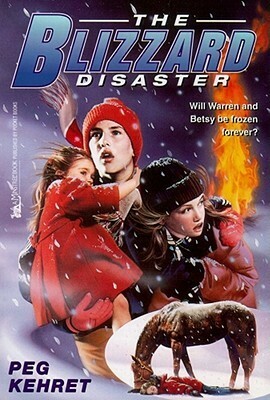 But when I read a book like The Blizzard Disaster, by Peg Kehret (1998, 137 pages) I’m so glad I have a blog that leads me to find book gems I might otherwise miss. Warren Spaulding and Betsy Tyler have teleported themselves back to Minnesota, 1940, to see the Blizzard of the Century and write an eyewitness class report. But their interest in the storm turns to horror when they realize that the Instant Commuter is frozen! This is an engrossing book from start to finish. Ninety percent of the storyline actually focused on a farm family in Minnesota in 1940, with the time travel of Betsy and Warren being a minor part of the book. I would like to ask the author how it is she is able to make me care about the characters and draw me into the plot on the very first page. In a relatively short book, how does she keep the action moving so swiftly, yet develop the characters so fully? This book does not “push any envelopes”, or use shock value to entertain–it’s just a story of a warm family coping with a natural disaster. The weather does not seem unusual when 12-year-old Janis goes to school at her one room schoolhouse on the morning of November 11, 1940. However, that afternoon a parent bursts into the room to retrieve his kids, explaining that a blizzard has begun. School is let out early. All the students are left on their own to walk home. No one could have predicted how swiftly the snow would fall. Soon it’s a struggle for Janis just to put one foot in front of the other through the deep drifts. Meanwhile, her dad has gone out to round up the cattle. He is old enough to know he risks dying of exposure in the storm, but if all his cows perish, how will he feed his family? As if that weren’t enough trouble, Janis’ younger sister Ellie also ventures out in the storm and quickly becomes lost. It is into such dangerous conditions that Betsy and Warren arrive. They quickly realize the weather is more than they bargained for. The smartest thing for them to do is time travel back home ASAP, but wait… Is that someone calling for help? I don’t think kids would learn much about history from this book, except that in a blizzard such as this Armistice Day Blizzard there are lots and lots of snow. ( I already knew this from living in Western NY when the Blizzard of ’77 hit. :)) As I mentioned, the time travel element is inconsequential. I loved the book simply because it was a suspenseful tale I couldn’t put down with great characters. There is a subplot having to do with Janis’ friendship with her pet horse which dovetails nicely with the main story. This entry was posted in Book reviews and tagged Book reviews, kids' time travel stories, Peg Kehret, The Blizzard Disaster, time travel books for children. Bookmark the permalink. Oh my, thanks for sharing this one. Will check to see if my library has it! Peg Kehret is such a great author. I have read quite a few of her books (and we interviewed her on our blog a while back and she is so nice). I enjoy books set in Minnesota- as a lot of my family lives there. This is one of her books that I haven’t read yet. I can’t wait to check it out. Awesome review! I’ll have to look for that interview. So glad to hear she’s a nice person, but I would have been terribly surprised to find out otherwise. That’s fun that books set in Minnesota have special meaning for you. This sounds like a beautifully cold one for summer reading! I’ll look for it. That’s an amusing idea–in the heat of summer to read books about cold times! In fact, I seem to recall you did a whole post about that once.